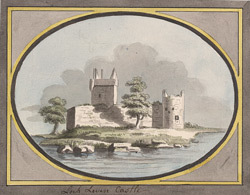 Loch Leven Castle was a royal castle from as early as 1257 when it was a small stone built keep standing in the corner of a walled courtyard. In the 15th century a five storey tower house was added. The original entrance was up an external staircase into the hall on the second floor but later this was removed and a window was converted into a door on the ground level. Queen Mary of Scots was imprisoned here in the Glassine tower from 1567-8 (until she escaped with the help of the Douglas family). It was during this time that she was forced to sign papers abdicating from the throne in favour of her son James.